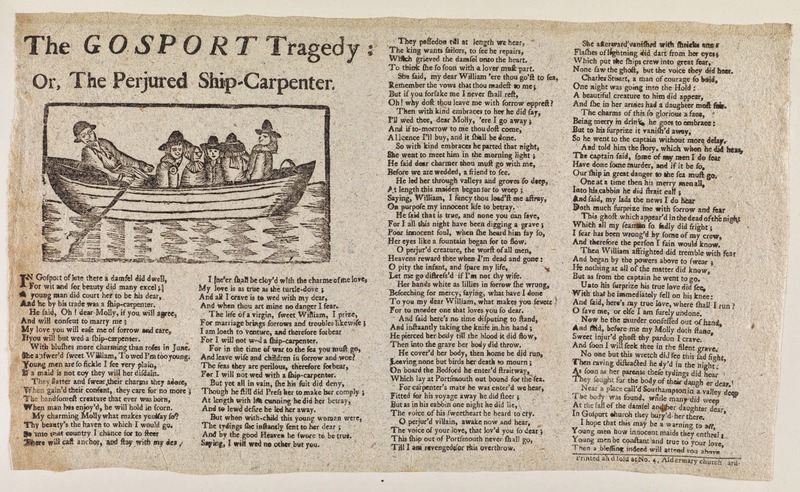 The GOSPORT Tragedy ; Or, the Perjured Ship-Carpenter, engraver unknown, 1760's, Walpole Library. A familiar theme in music and poetry of the eighteenth century is that of the untrustworthy mariner. "The False Young Sailor" is a good example of this, though it features a serial killer rather than a criminal guilty of one murder. In this case, a ship's carpenter by the name of William promises marriage to Molly before impregnating her. She pushes him to marry her before he signs aboard the Bedford in Portsmouth. Instead, he murders her and buries her body. Molly's ghost appears to him and warns that the ship will not leave Portsmouth until her murder is avenged. Following the ominous encounter, another sailor by the name of Charles Stuart finds a lone woman and child in the hold. Moving to embrace them, they disappear before his eyes. These apparitions cause the Captain to begin an inquiry, during which the ghost of Molly appears to William. The sight is too troubling for him, and he dies in the middle of the night. Versions of this ballad vary across Britain and America. It is a staple in English folk music, and has been recorded time and again throughout the 20th century. This woodcut is remarkably simplistic. 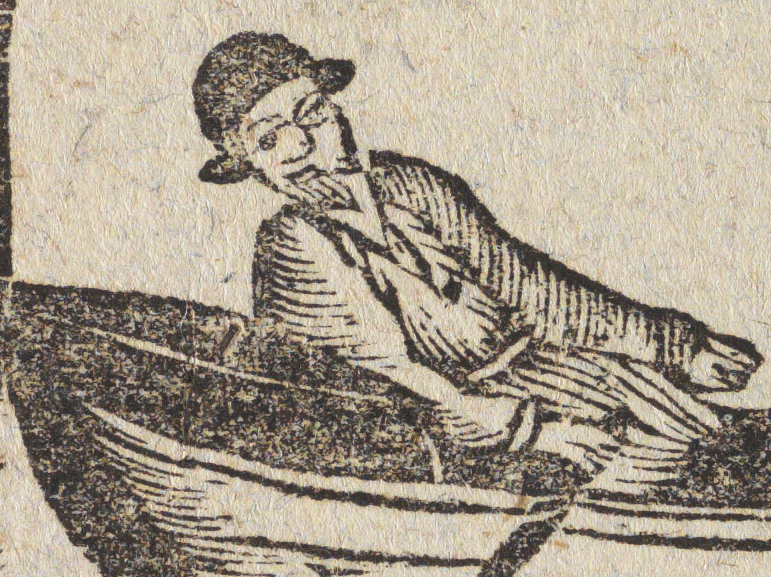 The fashions of the passengers aboard the boat are archaic for the time it was published, and perhaps is meant to suggest the figures are from an earlier time. At the bow, an oarsman rows the lot, and is presumably the false ship's carpenter William. His clothing does not contradict what we know of mid eighteenth century sailors: he wears a round hat or cap, a single breasted jacket, and loose fitting slops.